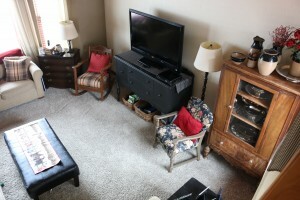 We recently had new windows installed and had to move all of the furniture in our living room. 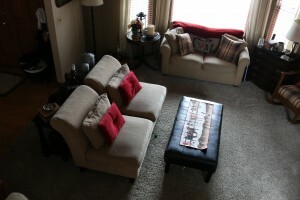 Once all of the furniture was moved, my kids and hubby decided they wanted to rearrange. Honestly, I don’t think that has ever happened in the entire time we’ve lived in this house, so I was all for trying new things! The main window in the living room has a pretty view of the mountains, so we didn’t want to hide it. I watched some videos from Yellow Prairie Academy and was even more inspired to try something new. We decided to move the tv to the other wall, which meant that we had to float some furniture in the middle of the room to have a good place to watch tv. Everybody requested that I leave the ottoman empty so they can easily put their feet up. I feel like there is a big hole to the left of the tv, so I ordered a wall ladder from Etsy to hang fluffy cream blankets on. 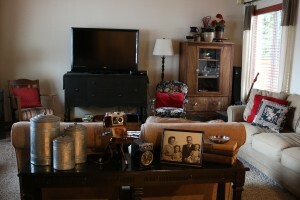 I really love antiques and the sofa table is the perfect place to display those. I wasn’t planning to keep the sofa table but the Yellow Prairie Interiors video suggested that it can help anchor the space. The more I look at it, the more I like it! 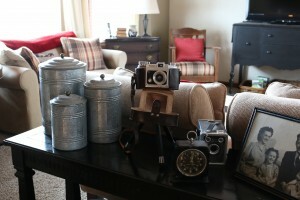 I also put my canisters, from Decor Steals, on the table. Galvanized is my favorite color. The tray holding the rocks and candle is one of my favorite antique store finds. I picked this up in an antique store in Central Oregon. It’s an old gold pan that was used when people would pan for gold. The store had a ton of these pans, which I thought was really cool. It’s not something you find in the Snohomish antique stores. 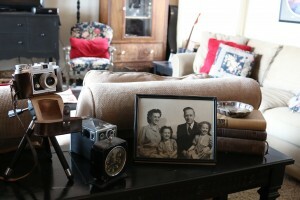 As I look around the living room, I notice how much I love old stuff. 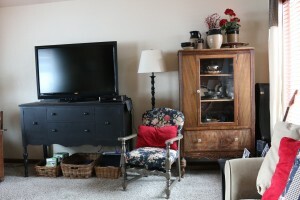 The buffet that the tv is on was purchased from Craigslist for $50 and painted black. I got the chair from a friend who was getting out of the antique business. 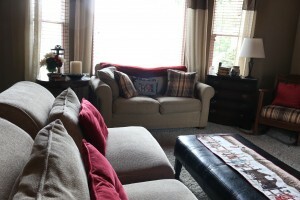 I painted it and had Calico Corners help me decide on a few different fabrics for my living room. The tall hutch, which holds all of the silver pieces I pick up at the Goodwill, is from my Mother-In-Law’s garage. 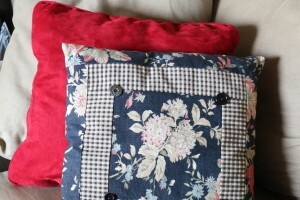 I still love the fabrics that I used to make pillows and drapes. I wanted to mix different patterns and the ladies at Calico Corners helped me figure out how to do that. 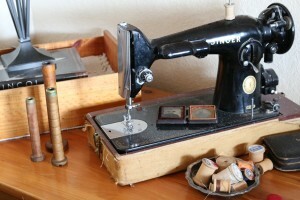 This is the room that houses my old sewing machines and spools. So far, we’re loving the cozy new look. 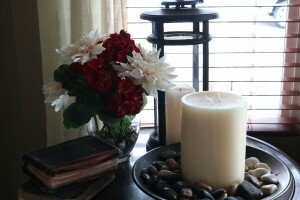 I think “cozy” is the key word in my decorating style. I want my home to feel like you just want to grab a blanket and snuggle up. Floating the chairs and ottoman in the middle of the room was hard for me because I love open spaces for my youngest to do cartwheels, but they all seem pretty happy with the change. Now, if the rain would stop and the sun would come out, I’d have a beautiful view of the mountains outside of my window! 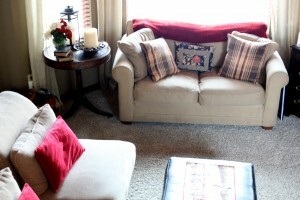 Be sure to check out Yellow Prairie Interiors if you are interested in learning about decorating your living room. 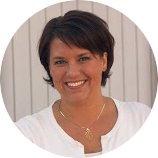 I really loved this webinar series!